One last post before I hibernate for the holiday (since I'll be studying for the next 3-1/2 days for my structures exam on Tuesday morning)! But before I go, I wanted to quickly share some of the changes that are happening in order to make the blog a little more presentable! Our new web address is www.bungalow54.com... yeah! Our very own domain! Also, did you notice the green '54' icon on the tab? Yeah, that's called a favicon, and ours is personalized! 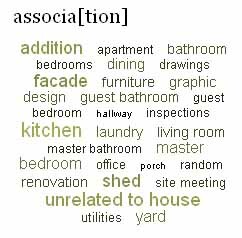 Plus, not sure if you've noticed that at the end of each post, there is usually a label, like kitchen or unrelated to house or graphics. Well, I also created a cloud in the sidebar, where these labels live. If you click on any of those words (only in the sidebar, since the image below, is in fact only an image), it will take you to all the posts that are written about that particular subject. I'm having a little too much fun with this whole blog thing, but I'm really enjoying discovering new tricks from other users online! Any cool things that you know how to do on your blog? I'm always interested! Keep your eyes peeled for more changes! You know, to go with the new domain name, and to stay away from any copyright infringement! Happy 4th of July! See you next week... when I still won't have a tan. Amazing that I live on the coast, and I'm still as white as a ghost.